Our most inexpensive and affordable grade of Butterfly Koi. 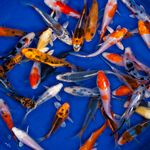 Standard Grade Butterfly Koi offer a great selection of varieties and colors at an unbeatable price. All Standard Grade Butterfly Koi have long and flowing Butterfly Fins. Any Butterfly Koi with short or stunted fins are removed before sale. Also, colorless, low quality cull-grade fish are removed. Standard Grade Butterfly Koi are a great option for your beginner Koi customers. Available from 3 to 4 inches.